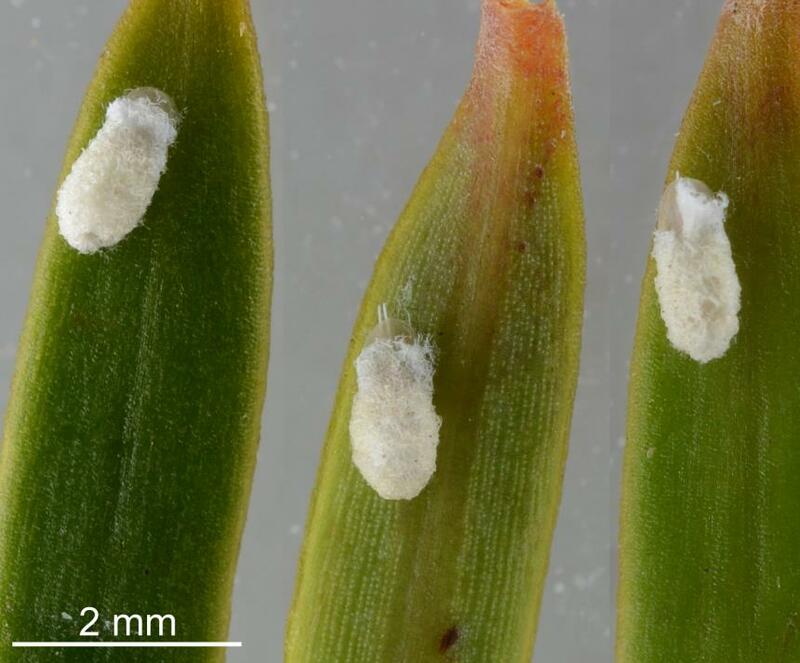 A recent study and review of Australasian felted scale insects in redefined the Genus Madarococcus. The authors found that the felted scale insects in the redefined genus Madarococcus were restricted to trees in the Family Nothofagaceae and that the Green totara scale, Madarococcus totarae (Maskell, 1890) did not belong to any known genus of felted scale. For this reason, the genus is given as Madarococcus s.l. until the situation is resolved. 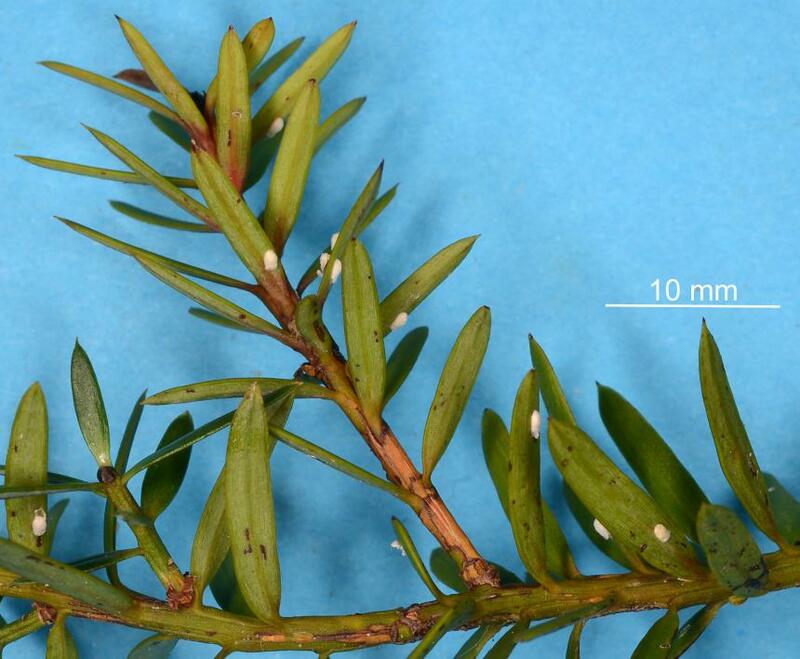 This endemic scale insect lives on leaves and stems of Totara, Podocarpus totara (Podocarpaceae) and other native species of totara. It is mainly found in native ecosystems in the North and South Islands. Conservation status: A native species found mainly in native ecosystems on Totara in the North & South Islands. Green totara scale breed in winter and probable a second time each year. 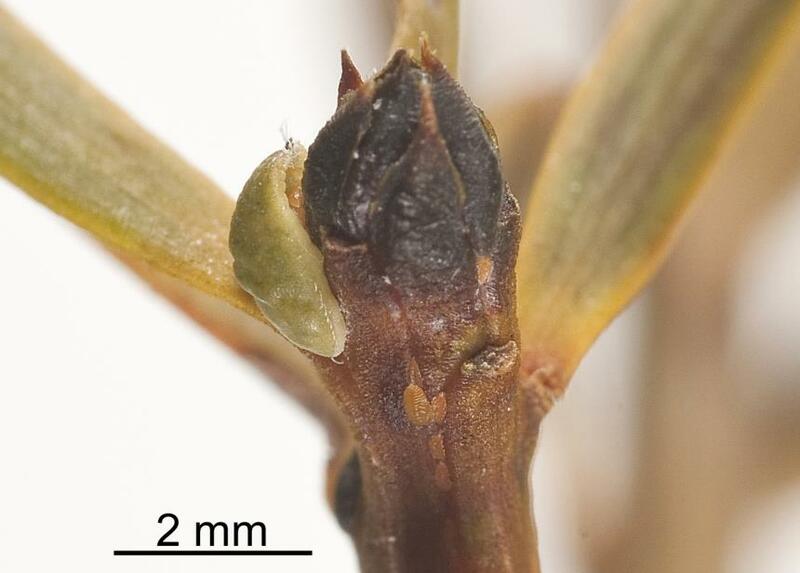 The active feeding stages and adult females are found on the younger plant stems, while males form white felted sacs on the underside of leaves and are the most obvious stage. The green adult females are usually found on a stem with the head end pushed into a leaf axil. After mating and growing to full size, the female produces eggs that can accumulate in a brood chamber under the abdomen. 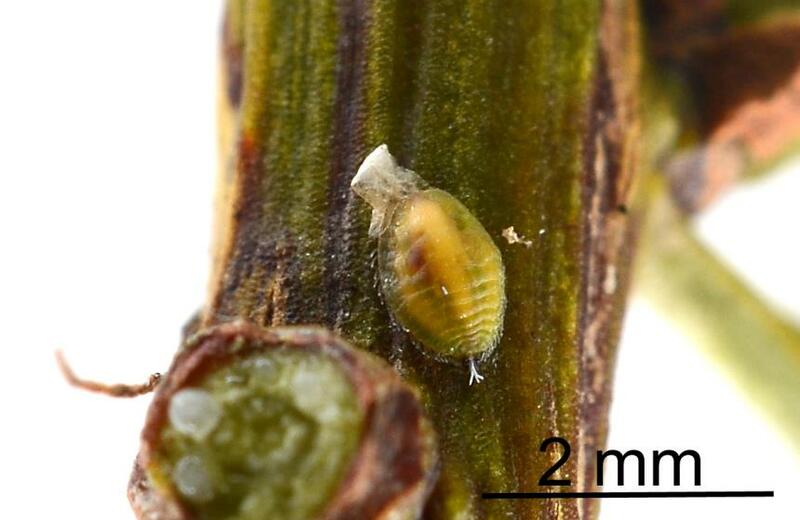 After hatching the first instar (stage) nymphs leave the brood chamber and settle in a crevice in the plant stem where they insert their stylets into the plant to feed. 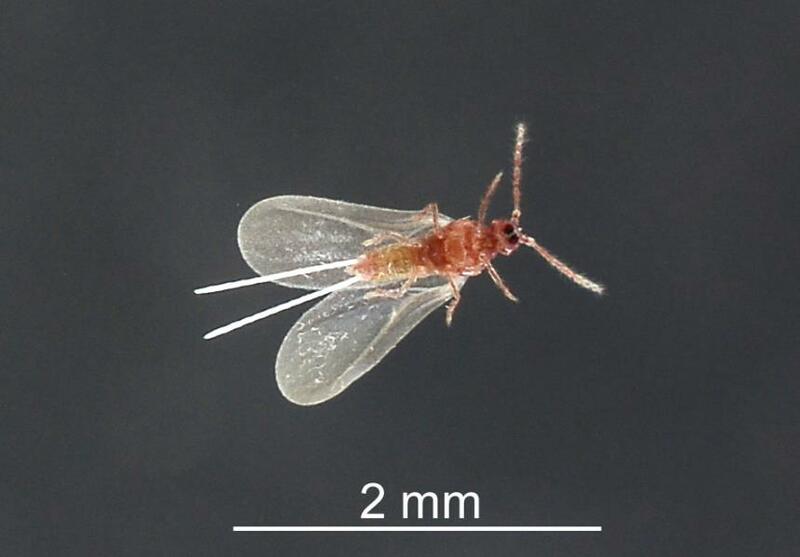 The nymphs have three pairs of legs and a pair of antennae. There are three female nymphal stages and two male nymphal stages. When a nymph is fully grown it grown it moults, their skin splits allowing the insect to grow a new and larger skin. The nymphs and adult females retain legs and can walk to find new places to settle and feed. The underside of the head has a short rostrum that holds the stylets used for feeding. 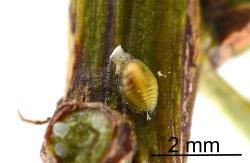 The first and second instar nymphs are oval shaped and flat. 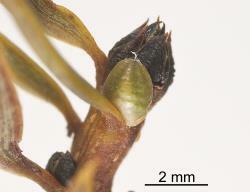 They usually live in a crevice in the young Totara stem. They are pale blown, with obvious body segments. They have a fringe of short wax spines and may have white wax filaments at their hind end. The adult female is similar, but green, rounder in shape and more swollen. When it is fully grown, its legs are probably too small for it to walk. Older females may become pale brown. 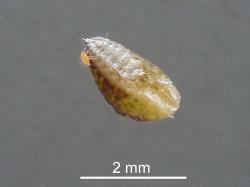 Unlike many other kinds of felted scale (Eriococcidae), female Green totara scale do not make a wax felted sac. 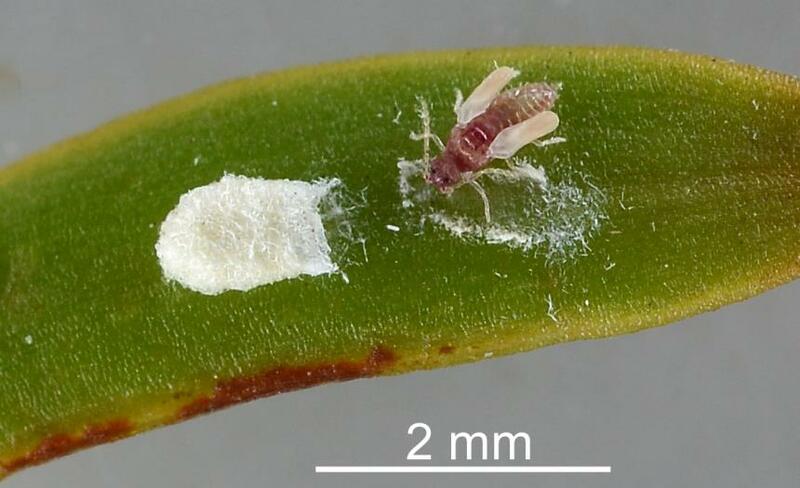 When the male second instar nymph is fully grown, it walks to the underside of a leaf where it settles and makes a white felted sac, a kind of cocoon. Within this sac, it moults into a prepupa, the first of two immobile, non-feeding stages. The second is a pupa that has wing buds. The moulted skins of the last nymphal stage, the prepupa and the pupa are pushed out the opening at the rear of the felted sac. After moulting the body, legs and wings of the adult male harden. It also grows two long white rods that help it balance when in flight. When it is ready, it backs out of its felted sac. It walks over leaves and the shoot looking for females with which to mate. 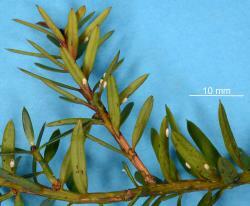 It may also fly to other shoots and trees to find colonies Green totara scale. The adult male does not feed. The nymphs and adult males and females retain legs and can walk. Fully grown females probably cannot walk. 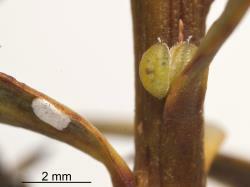 The first instar which is commonly called a crawler is the main stage for dispersal. 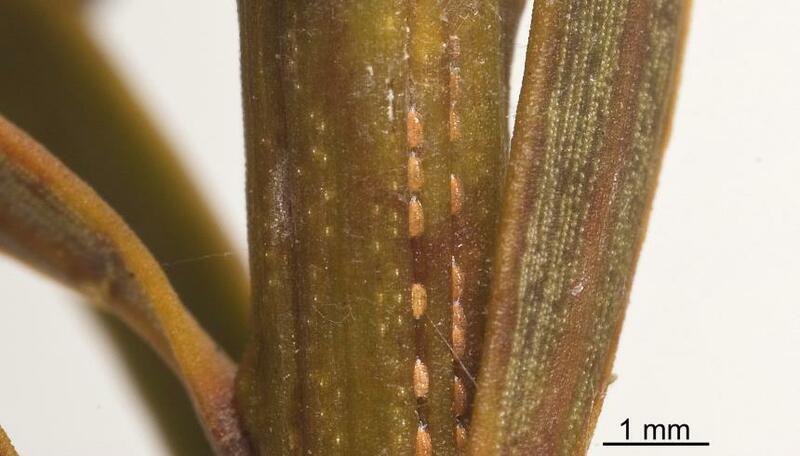 Most crawlers walk to a place on a plant stem where they settle to feed. Some crawlers disperse to other plants; most long distance dispersal is by air. It is not known if crawlers of this species go to high points of the plant and stand up to catch the wind. Adult males have wings as well as legs. 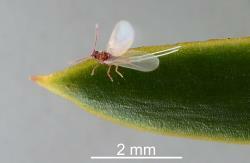 They can walk over leaves and stems in search of females with which to mate. They can also fly to nearby colonies, and may be carried further by wind. 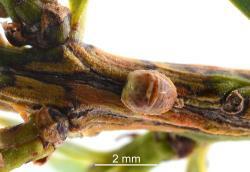 Scale insects require specialist skills for their identification. The Green totara scale is the only felted scale insect (Eriococcidae) known from Totara and other native Podocarpus species in New Zealand. The male white felted sacs on the underside of leaves are very distinctive and easy to see. The green adult female is usually tucked into the axil of a leaf. It is also distinctive. It is more difficult to see, but usually near where the white male sacs are found. No natural enemies of the Green totara scale have been reported. They may be preyed upon by birds and insect predators. 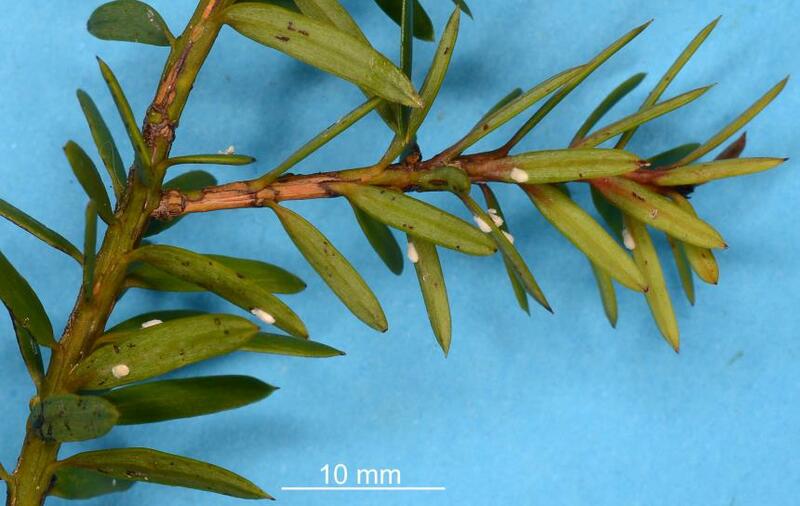 The Green totara scale insect lives on leaves and stems of Totara, Podocarpus totara (Podocarpaceae) and two other native species of totara. It may be discovered to inhabit other native species of Podocarpus. The adult females and younger feeding stages live mainly on the stems of young shoots. Large numbers of Green totara scale insects on young trees can cause severe damage to young shoots. 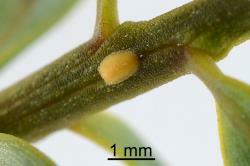 Like other Hemiptera, Green totara scale insects have sucking mouth parts. The long stylets, special shaped rods, are held in a short rostrum on the underside of the body. When the insect wishes to feed the stylets are then gradually pushed into the plant. 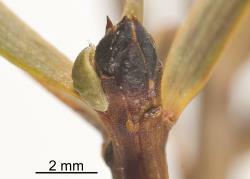 The inner pair of stylets, form two tubes, one through which saliva is injected into the plant and a second through which plants juices are sucked up into the insect. 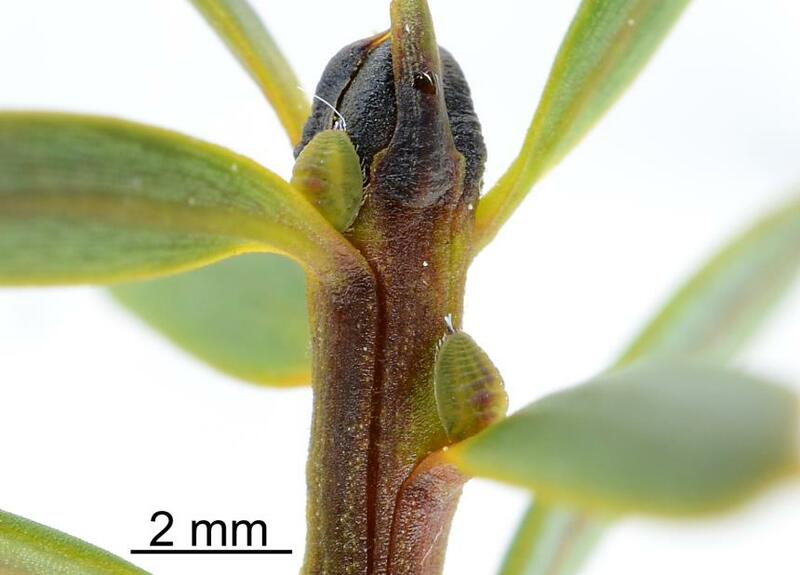 The Green totara scale inserts its stylets into the phloem, the plant vessels for transmitting sap from the leaves to other parts of the plant. The sap has a high volume of water and sugars, more than the insect needs. It excretes the excess water and sugar, which is called honeydew. Table: Host plants of the Green totara scale, Madarococcus s.l. totarae (Hemiptera: Eriococcidae) from Plant-SyNZ database (12 February 2018). The reliability score shows the quality of evidence for the host association (1-10, 10=high). 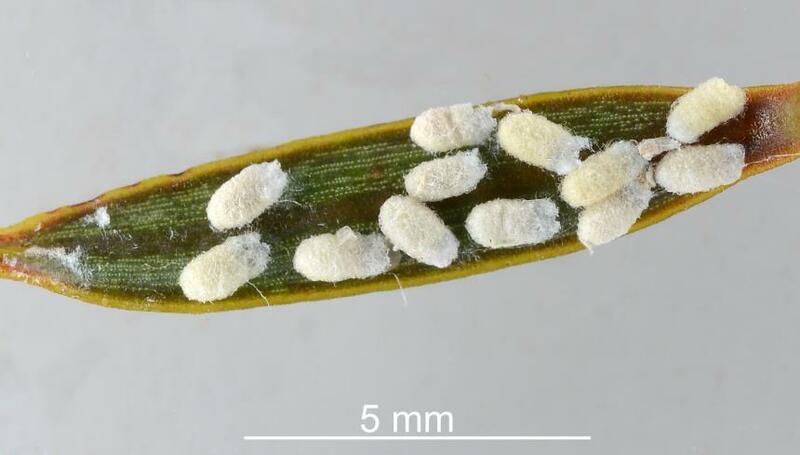 A 2008 study and review of Australasian felted scale insects in redefined the Genus Madarococcus. 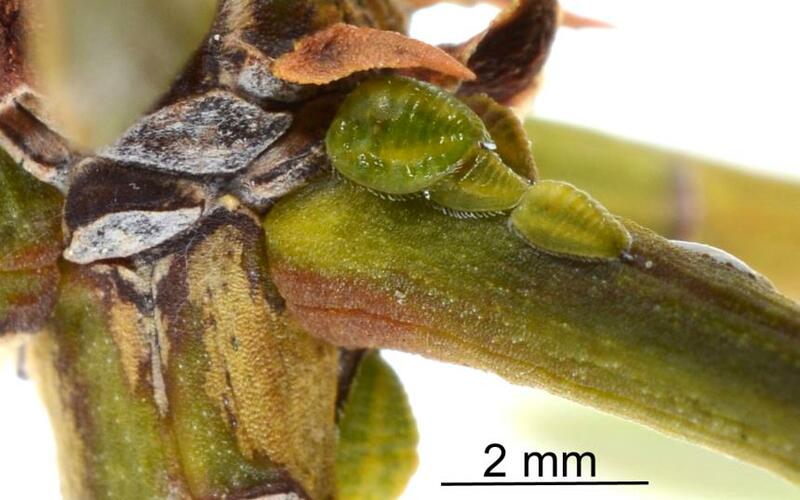 The authors found that the felted scale insects in the redefined genus Madarococcus were restricted to trees in the Family Nothofagaceae and that the Green totara scale, Madarococcus totarae (Maskell, 1890) did not belong to any known genus of felted scale. They found that it was closely related to two species found on Phyllocladus species that are also in (Podocarpaceae). 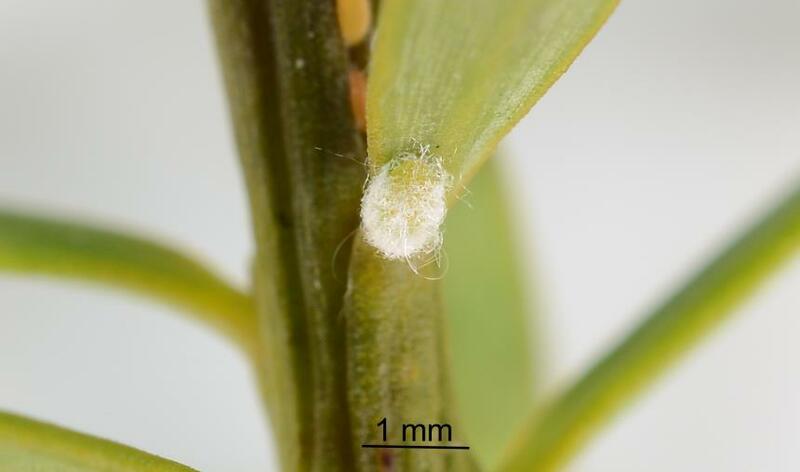 A study of the Eriococcidae on Totara and other Podocarpaceae would be useful to clarify the relationship between the felted scale insects in on plants in the family and to decide on the generic status of the Green totara scale. Esson MJ. 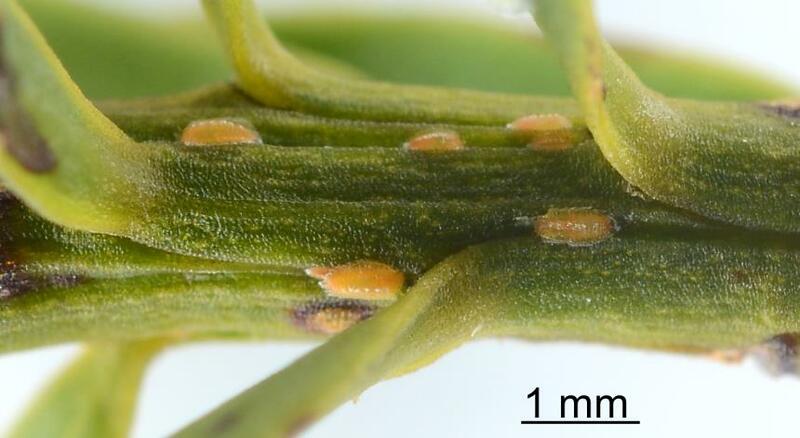 1994: Madarococcus totarae (Hemiptera: Eriococcidae) causing damage to seedlings. Weta 17(1): 6-7. Hardy N B, Gullan PJ, Henderson RC, Cook LG. 2008. 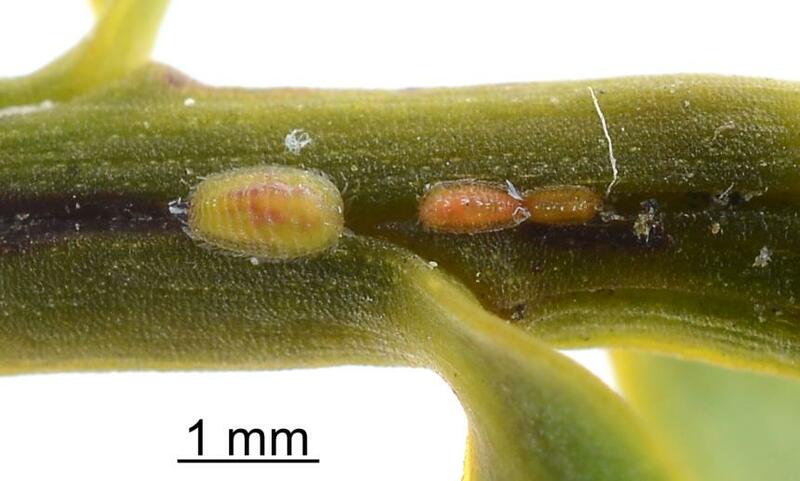 Relationships among felt scale insects (Hemiptera: Coccoidea: Eriococcidae) of southern beech, Nothofagus (Nothofagaceae), with the first descriptions of Australian species of the Nothofagus-feeding genus Madarococcus Hoy. Invertebrate Systematics 22: 365-405. Martin NA. 2018. Green totara scale - Madarococcus s.l. totarae. Interesting Insects and other Invertebrates. New Zealand Arthropod Factsheet Series Number 124. http://nzacfactsheets.landcareresearch.co.nz/Index.html. Date Accessed. ISSN 1179-643X.